DuraPlus Chimney Pipe by Simpson Duravent is a triple-wall, all-fuel chimney for use with wood stoves, fireplaces, furnaces, boilers, stoves, ranges, water heaters, or other appliances fueled by wood, oil, coal, or gas. DuraPlus chimney systems are designed to stay cool on the outside, to provide a hot draft on the inside, to boost stove efficiency, and to provide for a fire-safe design that protects both the chimney and the building. This triple-wall chimney features two insulating layers (ceramic blanket, plus air space). The ceramic blanket insulation is held securely in position, eliminating hot spots common with loose-fill type insulations. In the event of a creosote fire, the compressible blanket insulation permits the chimney liner to expand outwardly in a radial direction. DuraPlus chimney systems are UL Listed to UL 103 (MH7399). Refer to the Typical Installation drawings below to select the appropriate component parts for your installation. A DVL/DuraBlack Chimney Adapter or DuraBlack Slip Connector must be used when connecting DVL or DuraBlack stovepipe to a Ceiling Support, Wall Thimble, or Finishing Collar. A Snap-Lock Adapter must be used when attaching snap-lock stovepipe to DuraPlus. A Wall Thimble must be installed with an appropriate section of chimney pipe for all horizontal through-the-wall installations. To accommodate thicker walls a wall thimble extension can be field fabricated. An Attic Insulation Shield must be used in all installations that pass through an attic, regardless of whether the attic is insulated or not. If chimney is enclosed in a chase in the attic space, an Attic Insulation Shield is not required. A Firestop Radiation Shield must be used when a chimney passes through a floor or ceiling without a Ceiling Support Box. 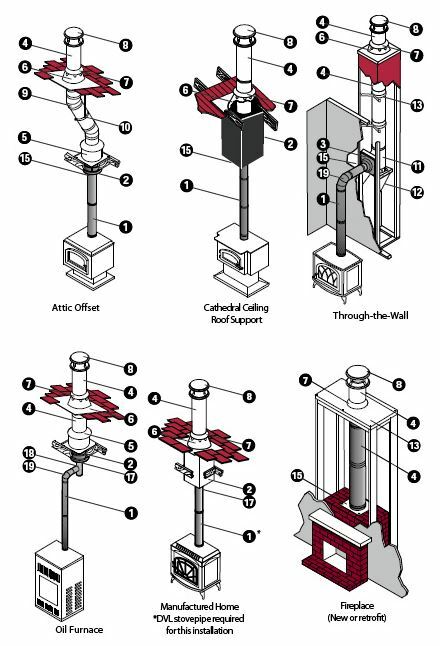 The following recommendations are intended as a general guideline to assist in the layout and selection of the chimney components needed for your installation. Always read and follow Simpson Dura-Vent Installation instructions before installing your chimney system, found with the cap or support box. Installation instructions can be viewed on the products item page. The diameter of the chimney should match the outlet size of the appliance. An improperly sized chimney results in poor draft and excessive creosote formation. Measure the diameter of the appliance flue outlet. Select the chimney and either DVL or DuraBlack connector stovepipe with the same size diameter as the appliance flue outlet. For fireplace installations, refer to the sizing chart in the back of this catalog. Determine if the installation is a through-the-roof installation or a through-the-wall installation. A through-the-wall installation will require additional components (Wall Thimble, Tee w/ Cap, Tee Support, and Wall Straps). Install the chimney in the interior of the structure whenever possible. A cold exterior chimney will produce less draft and will generate more creosote. 30° are not allowed in the United States. A maximum of two offsets in a single installation are permitted. Refer to the offset table in the back of this catalog. At least one Elbow Strap is required for each offset. Elbow Straps ensure adequate support. 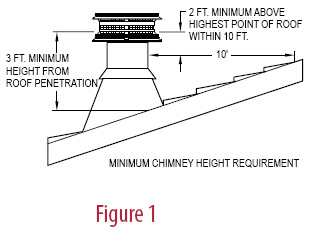 Determine the minimum chimney height above the roof line. Building codes require a minimum of 3' above the roof penetration and at least 2' higher than any portion of a building within 10'. See figure 1. The termination cap is installed above that point. Measure the roof pitch. For example, a 6/12 pitch has a vertical rise of 6" over a horizontal distance of 12". Select the appropriate flashing. 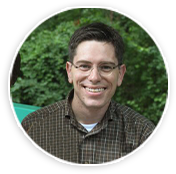 Determine the total length of chimney and stovepipe required for the installation. To calculate the installed per length of 6"-8" DuraPlus chimney pipe, subtract 1 1/2" per joint. Subtract 1 1/4" per joint of DuraBlack stovepipe. Subtract 1 1/2" per joint of DVL stovepipe. Minimum chimney height, at sea level of straight vertical chimney is 10' to 15' above the appliance outlet. Higher elevations, or the use of elbows or a tee, will require approximately 30% to 60% more height to provide for an adequate draft. Be fire safe. Maintain at least 2" clearance to combustibles. 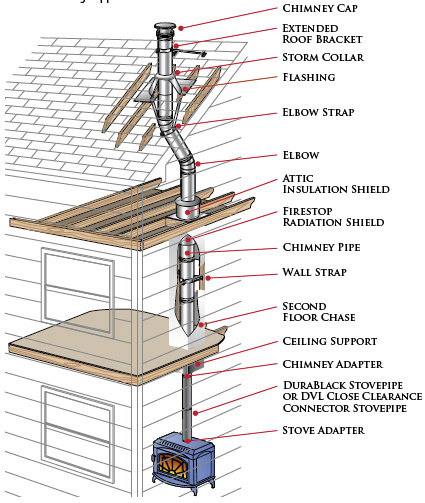 Follow local building codes and have your chimney inspected by a certified professional.